IJMUIDEN, The Netherlands (11th May, 2016) – Ardent has been issued the ISO 9001:2015 Certification for its Quality Management System for Preparedness, Emergency Response, Wreck Removal, Decommissioning, and Diving Services by Lloyd’s Register Quality Assurance. The ISO 9001: 2015 sets criteria for a quality management system, and evaluates organizations with their management approaches and customer focus. “I am very satisfied, and proud that we accomplished this in such a short time. Certification within 12 months of the company’s formation was a good challenge,” said Dave Stam, the Health, Safety, Environment and Quality (HSEQ) Manager at Ardent. “I started on the certification process a year ago, and spent half of my time at work on this project,” said Stam. “Good management translates to placing the priority on our clients, taking care of our employees, and efficient use of resources,” said Ardent CEO, Peter Pietka. The ISO 9001:2015 Certification was not new to the company. Svitzer had previously held the recognition prior to the merger. Ardent worked under pre-existing Svitzer systems in 2015, and was awarded the title after stringent audits. “The way we have organized our company, it intrinsically meets the standard, and we have used the audit as a tool to further develop management systems,” said Stam. “I am incredibly proud of our staff for their hard work, and I look forward to the years ahead,” said Pietka. Ardent formed as a merger of A.P. Moller-Maersk’s Svitzer Salvage, and Crowley’s Titan Salvage, and has recently celebrated it’s one-year mark of operations. Ardent expects to further qualify for more ISO certifications soon. 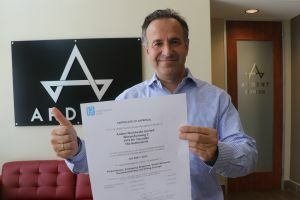 Ardent CEO, Peter Pietka displays the ISO 9001:2015 certificate from Lloyd's Register Quality Assurance.